Download "Back to School Car Safety. Direct Buy Warranty Staff September 19, 2014"
2 Back to school means school buses are back out on the roads, carrying children to and from school. Do you know the laws and safe practices for avoiding accidents with school buses and school bus pedestrians? You should always: Give the bus extra space: For your own safety and the safety of school bus passengers, it s a good idea to give school buses a wide berth. You should also yield right of way when school buses merge onto a freeway or need to get into your lane of traffic. They re practically the size of an 18 wheeler, after all! It s also important to give them space because buses often stop suddenly to load or unload children. Be aware of laws school buses have to follow: School buses are required to stop at railroad crossings and travel at slower speeds than the rest of traffic. Be prepared to deal with these situations if you re driving behind a school bus. Be hyper vigilant about school bus loading and unloading: When buses stop to let children on or off, you should be on high alert. Why? Because it can be difficult to see them, and this is often a very dangerous time for children to walk on the road. In fact, 30% of fatal school age pedestrian accidents include being struck by a vehicle on the road. When a school bus stops, so should you. Wait until you re sure every child is clear of the road. Be aware that children may be running nearby to get on the bus on time or rush home as soon as possible. If there are no sidewalks, children may walk in the street. And never, ever pass a school bus on the right side, as that is where children enter and exit the vehicle. 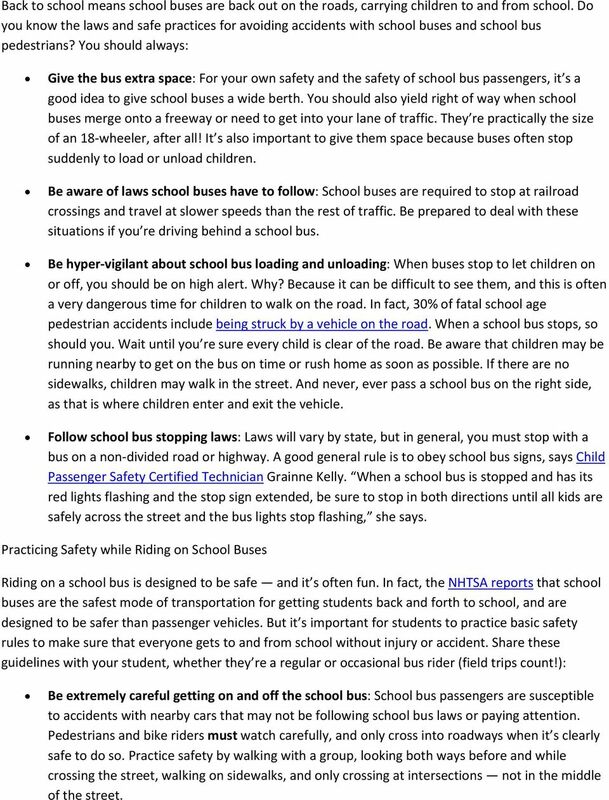 Follow school bus stopping laws: Laws will vary by state, but in general, you must stop with a bus on a non divided road or highway. A good general rule is to obey school bus signs, says Child Passenger Safety Certified Technician Grainne Kelly. When a school bus is stopped and has its red lights flashing and the stop sign extended, be sure to stop in both directions until all kids are safely across the street and the bus lights stop flashing, she says. Practicing Safety while Riding on School Buses Riding on a school bus is designed to be safe and it s often fun. In fact, the NHTSA reports that school buses are the safest mode of transportation for getting students back and forth to school, and are designed to be safer than passenger vehicles. But it s important for students to practice basic safety rules to make sure that everyone gets to and from school without injury or accident. 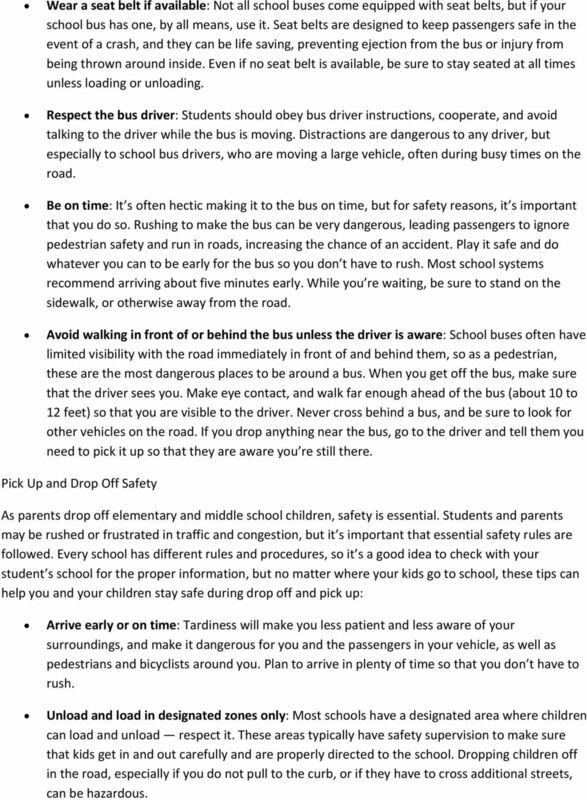 Share these guidelines with your student, whether they re a regular or occasional bus rider (field trips count! ): Be extremely careful getting on and off the school bus: School bus passengers are susceptible to accidents with nearby cars that may not be following school bus laws or paying attention. Pedestrians and bike riders must watch carefully, and only cross into roadways when it s clearly safe to do so. Practice safety by walking with a group, looking both ways before and while crossing the street, walking on sidewalks, and only crossing at intersections not in the middle of the street. 3 Wear a seat belt if available: Not all school buses come equipped with seat belts, but if your school bus has one, by all means, use it. Seat belts are designed to keep passengers safe in the event of a crash, and they can be life saving, preventing ejection from the bus or injury from being thrown around inside. Even if no seat belt is available, be sure to stay seated at all times unless loading or unloading. Respect the bus driver: Students should obey bus driver instructions, cooperate, and avoid talking to the driver while the bus is moving. Distractions are dangerous to any driver, but especially to school bus drivers, who are moving a large vehicle, often during busy times on the road. Be on time: It s often hectic making it to the bus on time, but for safety reasons, it s important that you do so. Rushing to make the bus can be very dangerous, leading passengers to ignore pedestrian safety and run in roads, increasing the chance of an accident. Play it safe and do whatever you can to be early for the bus so you don t have to rush. Most school systems recommend arriving about five minutes early. While you re waiting, be sure to stand on the sidewalk, or otherwise away from the road. Avoid walking in front of or behind the bus unless the driver is aware: School buses often have limited visibility with the road immediately in front of and behind them, so as a pedestrian, these are the most dangerous places to be around a bus. When you get off the bus, make sure that the driver sees you. Make eye contact, and walk far enough ahead of the bus (about 10 to 12 feet) so that you are visible to the driver. Never cross behind a bus, and be sure to look for other vehicles on the road. If you drop anything near the bus, go to the driver and tell them you need to pick it up so that they are aware you re still there. 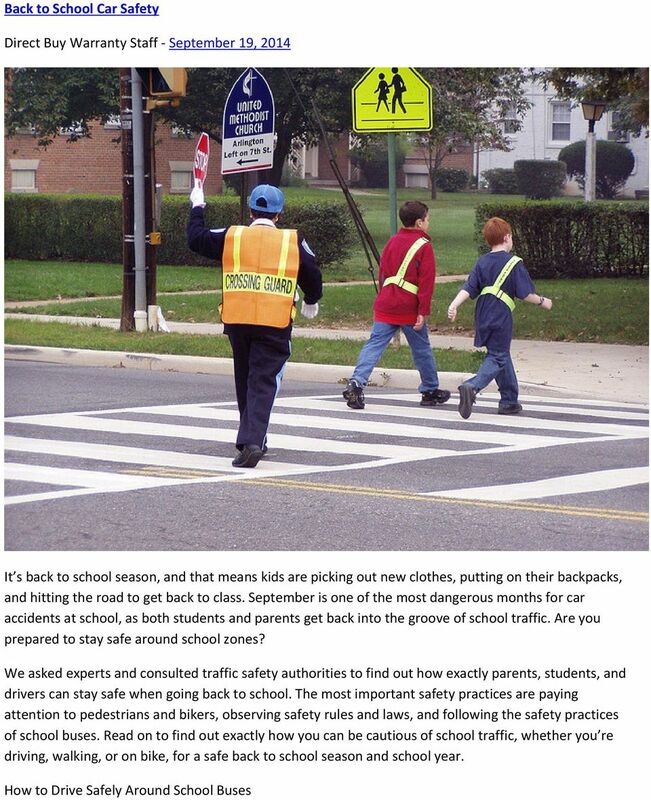 Pick Up and Drop Off Safety As parents drop off elementary and middle school children, safety is essential. 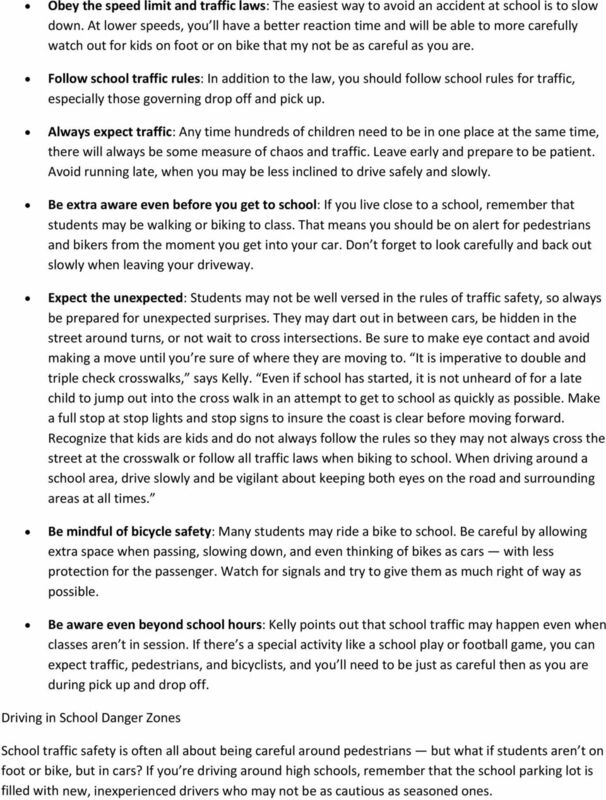 Students and parents may be rushed or frustrated in traffic and congestion, but it s important that essential safety rules are followed. Every school has different rules and procedures, so it s a good idea to check with your student s school for the proper information, but no matter where your kids go to school, these tips can help you and your children stay safe during drop off and pick up: Arrive early or on time: Tardiness will make you less patient and less aware of your surroundings, and make it dangerous for you and the passengers in your vehicle, as well as pedestrians and bicyclists around you. Plan to arrive in plenty of time so that you don t have to rush. Unload and load in designated zones only: Most schools have a designated area where children can load and unload respect it. These areas typically have safety supervision to make sure that kids get in and out carefully and are properly directed to the school. Dropping children off in the road, especially if you do not pull to the curb, or if they have to cross additional streets, can be hazardous. 4 Take care in the loading zone: When dropping kids off at school, take extra care to look for kids as you pull away from the curb, says Kelly. When exciting the school drop off line, take an extra look before merging into traffic of making a legal U Turn. Never park in spaces reserved for buses or emergency vehicles. Never use your cell phone: While it s fine to browse the web or check while you re waiting for the pick up line to start moving, once children are dismissed, put it away. It s essential that you give driving your full attention to avoid an accident. Carefully wait your turn: At many schools, students are only allowed to get into cars when they ve reached the designated loading zone. Even if you re in a rush, do not ask your child to get in the car before you get to the loading zone. Be respectful of other drivers: Help keep the flow of traffic safe and moving by being courteous to others. Avoid parking in the drop off or pick up line, do not double park to pick up or drop off, and avoid making u turns or turning around in driveways, as this contributes to congestion and may be dangerous. Avoid known pedestrian and bicycle routes if possible: If you can find an alternate route that allows you to avoid most pedestrian and bicycle traffic on the way to school, take it. This can help keep students who are not in cars safer on the way to school. Turn off your engine: While waiting for your child to be released from school, avoid idling in the road. Protect the environment and turn off your engine. 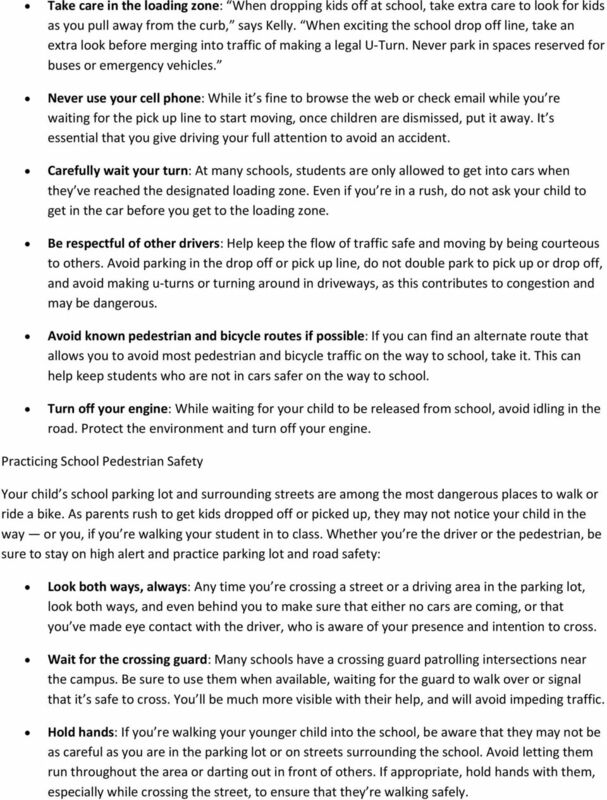 Practicing School Pedestrian Safety Your child s school parking lot and surrounding streets are among the most dangerous places to walk or ride a bike. As parents rush to get kids dropped off or picked up, they may not notice your child in the way or you, if you re walking your student in to class. Whether you re the driver or the pedestrian, be sure to stay on high alert and practice parking lot and road safety: Look both ways, always: Any time you re crossing a street or a driving area in the parking lot, look both ways, and even behind you to make sure that either no cars are coming, or that you ve made eye contact with the driver, who is aware of your presence and intention to cross. Wait for the crossing guard: Many schools have a crossing guard patrolling intersections near the campus. Be sure to use them when available, waiting for the guard to walk over or signal that it s safe to cross. You ll be much more visible with their help, and will avoid impeding traffic. Hold hands: If you re walking your younger child into the school, be aware that they may not be as careful as you are in the parking lot or on streets surrounding the school. Avoid letting them run throughout the area or darting out in front of others. If appropriate, hold hands with them, especially while crossing the street, to ensure that they re walking safely. 5 Watch for backups: If you re walking behind parked cars, don t assume that they will stay that way. Listen for engines, and watch carefully for brake and reverse lights before walking behind cars. Encourage children to walk with a friend: There s safety in numbers. Tell your child that it s a good idea to walk home with a friend if possible. 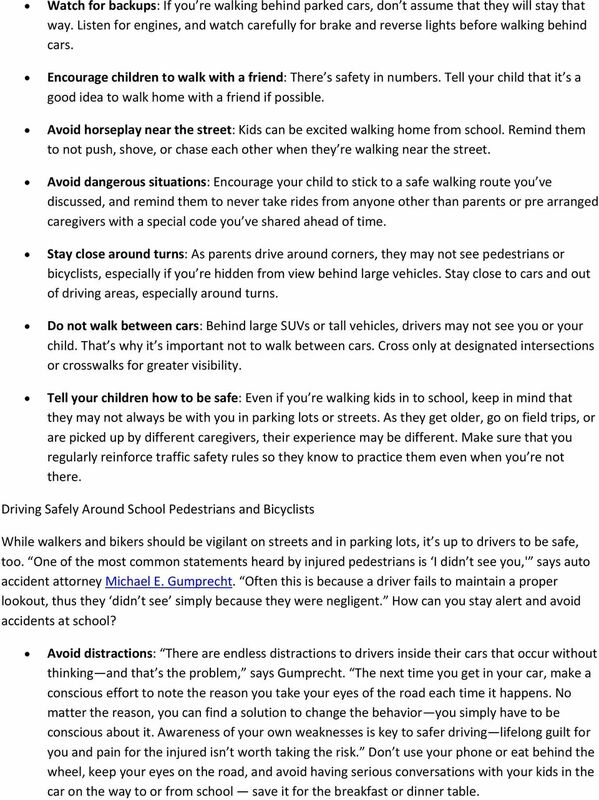 Avoid horseplay near the street: Kids can be excited walking home from school. Remind them to not push, shove, or chase each other when they re walking near the street. Avoid dangerous situations: Encourage your child to stick to a safe walking route you ve discussed, and remind them to never take rides from anyone other than parents or pre arranged caregivers with a special code you ve shared ahead of time. Stay close around turns: As parents drive around corners, they may not see pedestrians or bicyclists, especially if you re hidden from view behind large vehicles. Stay close to cars and out of driving areas, especially around turns. Do not walk between cars: Behind large SUVs or tall vehicles, drivers may not see you or your child. That s why it s important not to walk between cars. Cross only at designated intersections or crosswalks for greater visibility. Tell your children how to be safe: Even if you re walking kids in to school, keep in mind that they may not always be with you in parking lots or streets. As they get older, go on field trips, or are picked up by different caregivers, their experience may be different. Make sure that you regularly reinforce traffic safety rules so they know to practice them even when you re not there. Driving Safely Around School Pedestrians and Bicyclists While walkers and bikers should be vigilant on streets and in parking lots, it s up to drivers to be safe, too. One of the most common statements heard by injured pedestrians is I didn t see you,' says auto accident attorney Michael E. Gumprecht. Often this is because a driver fails to maintain a proper lookout, thus they didn t see simply because they were negligent. How can you stay alert and avoid accidents at school? Avoid distractions: There are endless distractions to drivers inside their cars that occur without thinking and that s the problem, says Gumprecht. The next time you get in your car, make a conscious effort to note the reason you take your eyes of the road each time it happens. No matter the reason, you can find a solution to change the behavior you simply have to be conscious about it. Awareness of your own weaknesses is key to safer driving lifelong guilt for you and pain for the injured isn t worth taking the risk. Don t use your phone or eat behind the wheel, keep your eyes on the road, and avoid having serious conversations with your kids in the car on the way to or from school save it for the breakfast or dinner table. 6 Obey the speed limit and traffic laws: The easiest way to avoid an accident at school is to slow down. At lower speeds, you ll have a better reaction time and will be able to more carefully watch out for kids on foot or on bike that my not be as careful as you are. Follow school traffic rules: In addition to the law, you should follow school rules for traffic, especially those governing drop off and pick up. Always expect traffic: Any time hundreds of children need to be in one place at the same time, there will always be some measure of chaos and traffic. Leave early and prepare to be patient. Avoid running late, when you may be less inclined to drive safely and slowly. Be extra aware even before you get to school: If you live close to a school, remember that students may be walking or biking to class. That means you should be on alert for pedestrians and bikers from the moment you get into your car. Don t forget to look carefully and back out slowly when leaving your driveway. Expect the unexpected: Students may not be well versed in the rules of traffic safety, so always be prepared for unexpected surprises. They may dart out in between cars, be hidden in the street around turns, or not wait to cross intersections. Be sure to make eye contact and avoid making a move until you re sure of where they are moving to. It is imperative to double and triple check crosswalks, says Kelly. Even if school has started, it is not unheard of for a late child to jump out into the cross walk in an attempt to get to school as quickly as possible. Make a full stop at stop lights and stop signs to insure the coast is clear before moving forward. Recognize that kids are kids and do not always follow the rules so they may not always cross the street at the crosswalk or follow all traffic laws when biking to school. When driving around a school area, drive slowly and be vigilant about keeping both eyes on the road and surrounding areas at all times. Be mindful of bicycle safety: Many students may ride a bike to school. Be careful by allowing extra space when passing, slowing down, and even thinking of bikes as cars with less protection for the passenger. Watch for signals and try to give them as much right of way as possible. Be aware even beyond school hours: Kelly points out that school traffic may happen even when classes aren t in session. If there s a special activity like a school play or football game, you can expect traffic, pedestrians, and bicyclists, and you ll need to be just as careful then as you are during pick up and drop off. Driving in School Danger Zones School traffic safety is often all about being careful around pedestrians but what if students aren t on foot or bike, but in cars? If you re driving around high schools, remember that the school parking lot is filled with new, inexperienced drivers who may not be as cautious as seasoned ones. 7 Watch for missed signals: Teens may forget to put on blinkers so be ready for them to turn (or not) at any point. Be ready to merge: New drivers in a rush to get home or to a fun activity may not follow appropriate right of way rules. Give them space and be ready to yield to them, even if it s not technically theirs. Be extra alert: As with any school zone, you should be on high alert for any traffic hazards that may pop up. Slow down, pay attention, and be ready for traffic and chaos. pledge Signature: To be Tennessee Traffic Safe, I pledge: 1. To always buckle up! 2. To wear a helmet when riding my bike! GET IT IN WRITING. PARENTS ARE THE KEY TO SAFE TEEN DRIVING. LEARN HOW. Aguide for sharing Vermont s roads for bicyclists, pedestrians, motorists and others. Please VERMONT Agency of Transportation Vermont s roadways are used by motorists, pedestrians, bicyclists and others. Smart Cycling IN SANTA MONICA SANTA MONICA POLICE DEPARTMENT BE SMART. BE VISIBLE. BE ATTENTIVE. HAVE FUN! This document meets the requirements of the Québec government standard for Web accessibility SGQRI 008-02 in order to make it accessible to everyone, regardless of whether or not they have a disability. Document Name: Driving Skills. Purpose: To outline necessary driving skills required to maximize driving safety. THE TOOL KIT. The ENCOURAGEMENT APPROACH uses events and contests to entice students to try walking and biking. Bicycle Riding. WHAT ARE the. One Final Note... It is against the law to ride a bicycle under the influence of alcohol and/or drugs. (21200. Traffic Safety Game Show Bicycle Safety lesson 2 of 3 Grade level: 4 Subject Area: Physical Education, Health Skill Set: Bicycle Safety Introduction This is the second of three bicycle safety lessons. 2014-2015 School Year Type III Driver Regulations In 2008 the Minnesota Legislature created several sections of law requiring annual training and certification of persons that operate Type III School Buses..
Driver vs Cyclist 1 Florida s Struggle to Share the Road A Study Commissioned By: The Battle between Driver and Cyclist Embracing the culture of cycling is a perpetual issue in the United States today. AHIS Road safety project Student Council THINK! DMV. OREGON TRAFFIC ACCIDENT AND INSURANCE REPORT Tear this sheet off your report, read and carefully follow the directions. BE SMART! BE RESPONSIBLE! BE ALERT! BE SAFE! Your life and the lives of those around you depend on it! Signs, Signals and Road Markings Traffic lights: position of lights and sequence The most common type of traffic light has three lenses. Red is on the top, yellow in the middle, and green on the bottom.